Referred to as the marble temple in common books and information sources, Wat Benchamabophit (The Marble Temple) displays the marvels of architecture along with an idol of Buddha. The interiors are deep red and gold. The gorgeous temple was built in the late 19th century under Rama V. The temple is a symbol of peace and tranquility. 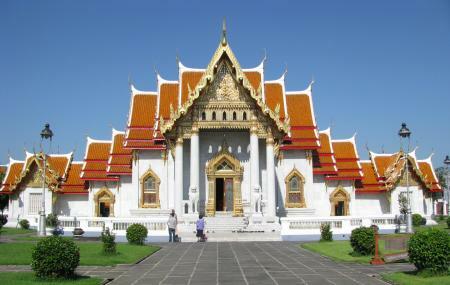 If you enjoy peaceful moments, do visit the Marble Temple when in Bangkok. Maintain peace and silence in the temple. How popular is Wat Benchamabophit? People normally club together Wat Phra Kaew and Wat Saket while planning their visit to Wat Benchamabophit. Great place for worship. Honorable king 👑 had shown his love and respect towards almighty. It is really a must visit place in Bangkok. If drinkable water 💦 arrangements are made there then it will be better. I may haven't found it or may not be approachable for everyone. It will be appreciated much if attention towards my feedback is given. I literally came across this place on accident as I was riding my motorbike and I don’t regret stopping at all! You can really see the marble which adds and nice shine to the exterior and interior of the structure. Once inside there is an open corridor with better views of the temple IMO than the front because when I went it was pretty quiet without any tourist crowding around the main photo points! 50 baht entry. Bathroom is clean and free to use. Place was beautiful but very small. No sign for entrance so look for the side with buses. Based on Googled directions it was a little hard to get to and a very long walk which is not good to do in Thailand heat. Place with Thai's temple authenticity. You'll be amaze by the handcrafts deco on surrounding the temple. Just have a sit in the temple for awhile to observe everything. Good photos can be taken too around the area. But remember to buy tickets for entrance, cant remember how much was the entrance fee.